The pipelaying vessel Pioneering Spirit completed the construction of the offshore section of the TurkStream gas pipeline yesterday. The President of the Russian Federation, Vladimir Putin, and the President of the Republic of Turkey, Recep Tayyip Erdogan, gave the command to weld the final joint of the second line of the gas pipeline. 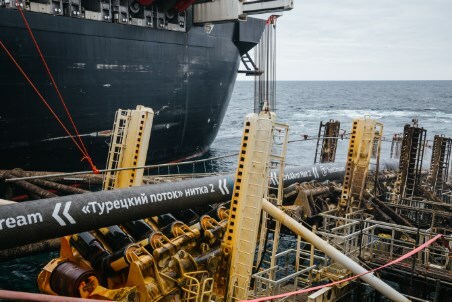 The construction of TurkStream, the new gas pipeline connecting Russia and Turkey across the Black Sea, is now entering its final stage. The works are ahead of the schedule, since laying the offshore section of the gas pipeline has been completed early, and not in December as planned earlier. Rapid pace of the project implementation is the result of the well co-ordinated and concentrated efforts of the project team. The gas pipeline will become operational at the end of 2019. ‘It will reinforce the energy security of Turkey and the Southern and Southeastern Europe further’, noted Alexei Miller, the Chairman of the Management Committee of Gazprom PJSC. Allseas Group is the world’s leading company in offshore pipelaying and subsea construction. The company is focused on comprehensive project implementation, including design, material and equipment procurement, construction and commissioning. Allseas is the construction contractor for both lines of the TurkStream offshore gas pipeline. Pioneering Spirit is the largest construction vessel in the world, 477 m long and 124 m wide, designed for deepwater pipelaying, installation and removal of large oil and gas offshore platforms. The vessel is owned by Allseas.